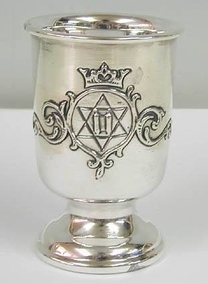 sterling silver Kiddush cup A beautiful artisan 925 sterling silver Kiddush cup, Judaica. 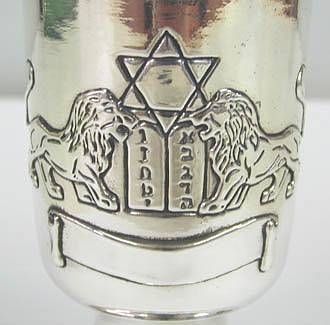 Ornamented on the body with two lions flanking a Decalogue, surmounted by a Magen David (Star of David) while underneath it there is a beautiful ribbon made especially for an inscription. On the other side there is a foliage design, centered by a Magen David and surmounted by a crown. This item was made in the electroforming method. Measurements: Height: 3.9in. / 9.906cm. Diameter: 2in. / 5.08cm. Weight: 176gr. / 5.659oz. Marks: 925 for sterling silver.